During our 14-day road trip through Iceland, our son C was most excited to see the Puffins Iceland has become famous for. But figuring out where to see puffins in Iceland wasn’t easy. Puffins can only be found in a few places in Iceland. And, puffins are only in Iceland at certain times of the year. But, after all our research, we finally found the best place to see puffins in Iceland, and we’re going to share it with you! 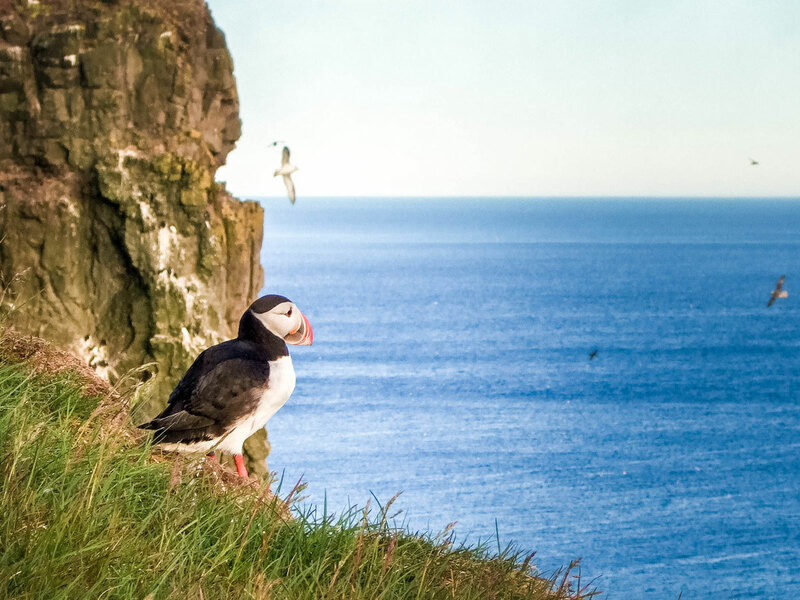 The Latrabjarg puffin cliffs are far off of Iceland’s beaten path. The Westfjords of Iceland are often overlooked by visitors due to its remoteness. It’s a shame, the Golden Circle is incredible, but Iceland’s Westfjords offer one of the most unique and intimate experiences in the country. Because it’s so remote, the tourist traffic through the region is very light and you will feel like you have the whole place to yourself for much of it! Iceland Puffins, beyond being adorable, colorful, and fun to watch, are actually mysterious little creatures. They spend most of their lives at sea. They return to land and form colonies for breeding and hatching their young. About 60 percent of the world’s Atlantic puffins nest in Iceland From April until September each year. Atlantic Puffins are fantastic swimmers. Often diving below the waves to catch herring and sea eels. But when they fly, they can flap their wings up to 400 times per minute and fly at up to 80 km/h. Every year there are are between 8 and 10 million puffins in Iceland. 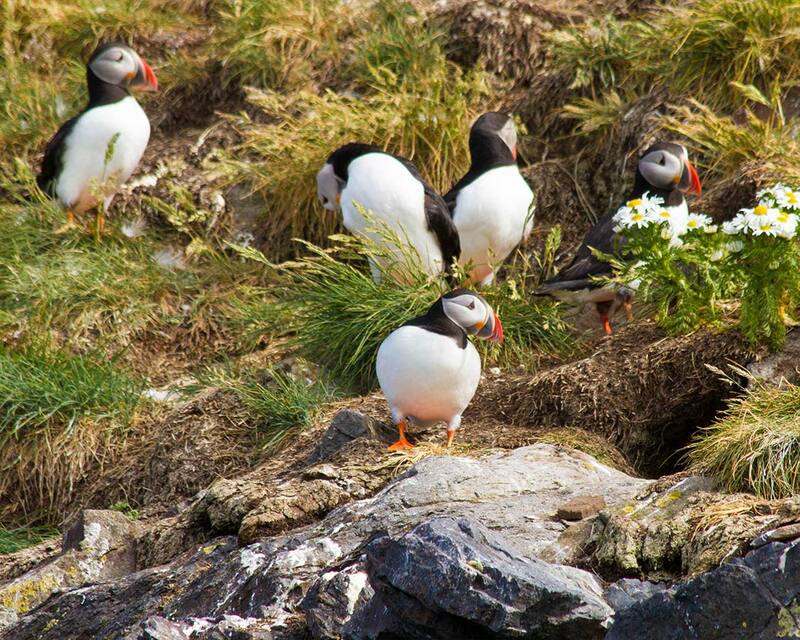 In fact, Iceland is home to over 60% of the worlds puffins! Those visiting Iceland in summer, between the months of May and August have the best opportunity for getting a glimpse of these special birds. This short time is when puffins return from their life at sea to nest and lay their eggs. If you visit outside of this 4-month window, the puffins will likely be back out at sea. If you are short on time, Iceland’s puffins are most active in the evening. And for those visiting mid-summer, this means that you might have to stay up late to see the birds at their most active. While there are no puffins in Reykjavik directly, there is a large colony of puffins on two small islands within a half-mile boat ride of Reykjavik. The islands of Akurey and Lundey house quite a number of these fun birds. The largest puffin colony in Iceland is on a series of islands in South Iceland. 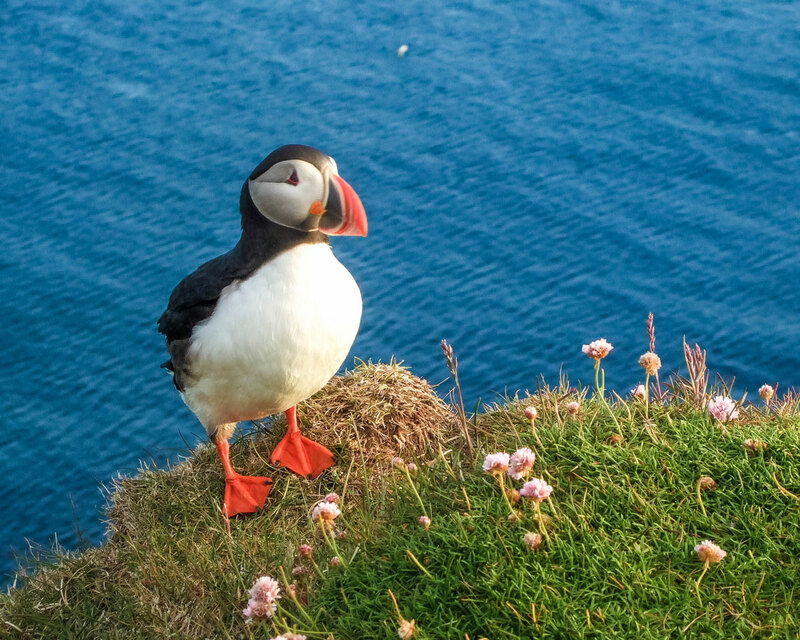 The Westman Islands, which are about 6-miles out from the mainland are home to one-fifth of the world’s puffins! There are many different bird species here as well, with the largest diversity of birds in Iceland located on the Westman islands. You can reach teh Westman Islands by public ferry from Landejahofn or Seljalansfoss or via a domestic flight from Reykjavik. Papey Island off of the coast of East Iceland is home to a large population of puffins. This picturesque island has been uninhabited since the 1940’s. Papey Island is still home to the oldest wooden church in Iceland, and it’s rumored to be the home of an Icelandic giant as well. The Latrabjarg Cliffs in Icelands Westfjords are perhaps the most dramatic location to witness the Icelandic puffins. This 8-mile stretch of cliffs that reach heights of over 1447 ft are filled with millions of birds. Latrabjarg is the most popular spot in Icelands Westfjords, and its popularity is well-deserved. 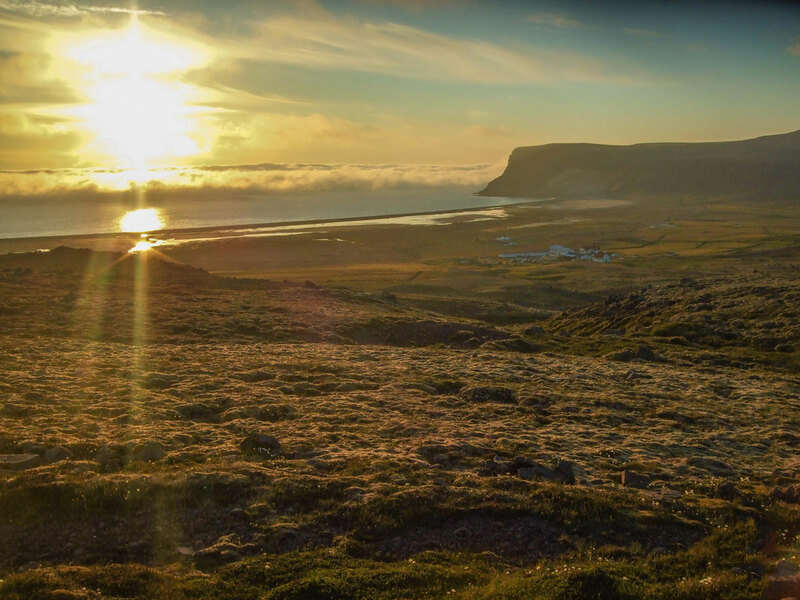 Read more about why you should visit the Westfjords here. Getting to Latrajbjarg can be done in one of two ways. The first requires driving west along the Ring Road from Reykjavik and turning on 60 towards the Westfjords. The whole journey takes around 6 hours and offers incredible views of the spectacular Icelandic fjords. The second, which we chose, had us heading west on HWY 54 towards through Arnarstapi. Arnarstapi had it’s own incredible bird cliffs that are worth visiting. From there we went up to Stykkisholmur and caught a ferry across the Westfjords. You land on HWY 62 near Flokalundur and heading west from there. If you have some time to spare when you’re in Stykkisholmur and are looking for something completely different, check out the Library of Water. 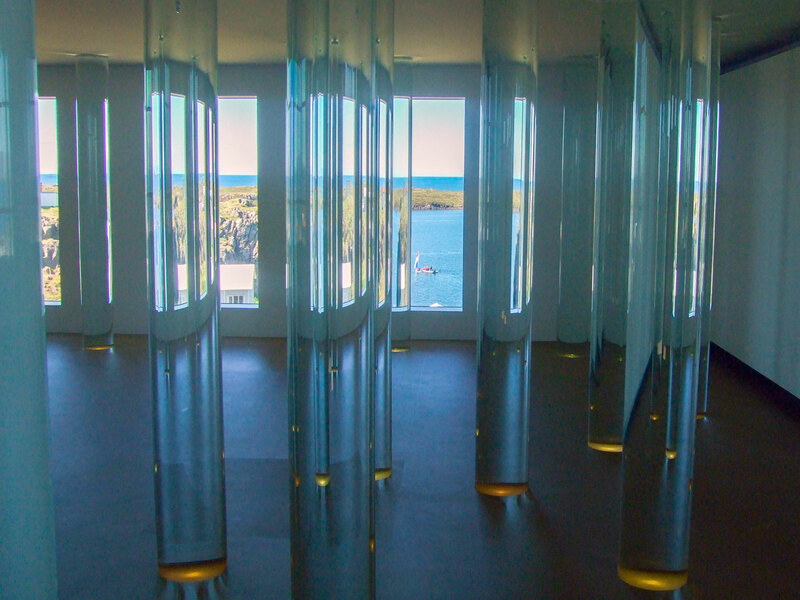 The library has 24 cylinders of water collected from different glaciers around Iceland and acts as a writers studio for various local and international artists. If you like water, you can definitely see it here, in tube form! Once you reach the Westfjords, things start getting really interesting. The road travels along an ancient Viking trade route and is lined with cairns. Along the way, we came across an incredible Viking statue on the road. We still haven’t been able to find any information on it. 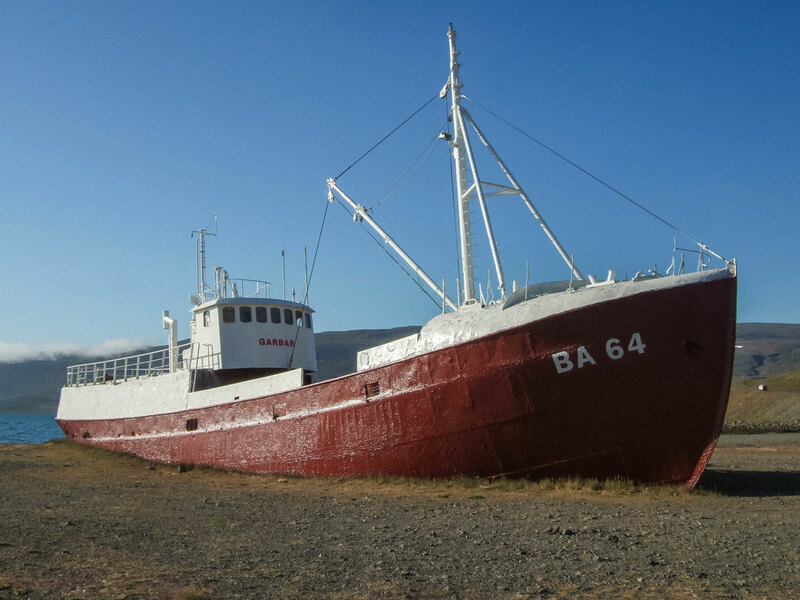 We also passed by the wreck of the oldest steel ship in Iceland, the Gardar. You can see the ship lying on a beach as you pass by Patreksfjordur. Pro-Tip: The last stretch along HWY 612 offers no services, so make sure you have a full tank of gas and anything you might need in case of any car trouble. We made the rough drive for the last 36 km and pulled into the Latrajbjrag Hotel at around 10:30 PM and got ourselves checked in. The Latrajbjarg Hotel was fantastic. Beyond being the only hotel anywhere close to the Latrajbjarg Puffin Cliffs, they also cater to travelers from all over. Even though it was so late when we rolled in, and we were incredibly hungry, the on-site restaurant was still pumping out hot, tasty food. The hotel also offered both serviced and tent camping for all sorts of travelers who sought out budget tips for Iceland. This made for a cool and hip travel vibe. C had spent his time in the car having a nap. We never adjusted ourselves to local time, choosing instead to take advantage of the nearly 24-hours of daylight. After getting recharged with a great meal, we made the quick jaunt to the Latrajbjarg Puffin Cliffs. It was nearly midnight when we arrived. We had just hit the perfect golden hour as the sun slowly grazed near the horizon. We parked and made the short climb up a hill to the top of the cliffs and were absolutely astounded by what we saw. The Latrabjarg cliffs stretch for 14 km and, in the summer, are topped by brilliant green grass. At the cliff’s edge, we saw thousands of puffins and razorbills. The views were spectacular and C was in awe of all these tiny birds darting everywhere. The edge of the cliff had little more than an ankle-high rope to warn visitors about the long fall and sudden stop that awaited them if they ventured too close to the cliff’s edge. As a photographer and lover of nature, I appreciated the subtle security measure. Christina and I kept a close reign on C to make sure he didn’t find himself in danger. At 415 meters high, the Latrabjarg Puffin Cliffs are the largest seabird cliff in Europe and is without a doubt one of the most spectacular sites in the country. We had to tear ourselves away from the Latrabjarg Puffin Cliffs to head back to the hotel and get some sleep. The following day we had a packed schedule, planning to visit a Viking village recreation, and of course more waterfalls. But the beauty of Iceland never ceases. We were blessed with this beautiful sunset as we drove back towards our beds for the night, C, already fast asleep. If this hasn’t given you a reason to visit Iceland, what more are you looking for? Do you ever travel off the beaten path when you travel? What’s the most remote place you’ve visited? Let us know in the comments! These birds are really adorable! Unfortunately cliffs are not my favorite places : first because I have vertigo, and then because I am way too stressed to stroll around with little ones 😉 Big up for the intrepid Wagars! I guess the most remote place I ever went was the Chitwan National Forest and hiking in the Annapurna mountains in Nepal. It was wonderful. 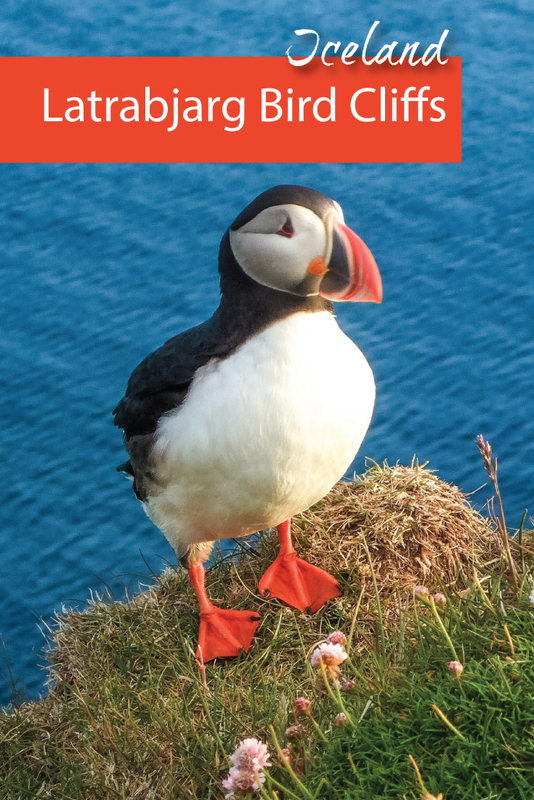 I love this article because I would love to meet the puffins so seeing the photos and reading about your experience is pretty awesome. They are so colorful and animated and how fun that you captured those closeup photos. Sounds like you could have spent even more time there. Really enjoyed reading about your adventure. Iceland is magical, isn’t it? We’ve been to Iceland too and explored many sights and tried out various experiences. Hope you can drop by to see those posts! Puffins are so adorable! I loved touring the puffin cliffs in Newfoundland. Would love to have your experience in Iceland. It looks great! I really, really want to see a Puffin! As does my daughter. We have a wonderful book called Polly and the Puffin which is about a little girl who rescues an injured bird and cares for it until he’s well enough to fly away again. Ever since reading this, we have both been obsessed! Hopefully we’ll get to see them in Iceland one day! Sounds like a great book. I’ll look it up! Ahhh!!! Our 3 year old would go wild for that puffin… as would I! Except I’d probably try to snuggle it and get in trouble. Thanks for this peek into off-the-beaten-path Iceland! Ah, how lucky you were! When we visited Iceland during the September of last year, the Puffins had left around a fortnight earlier! 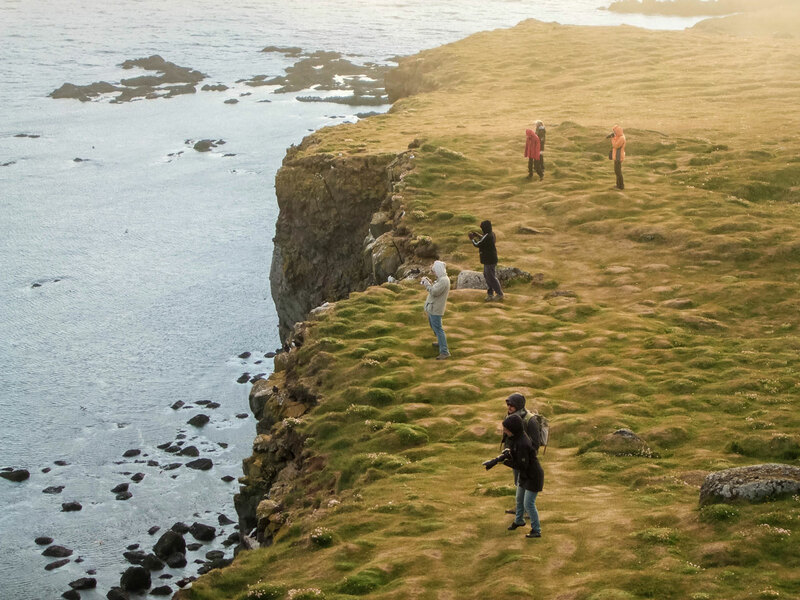 The puffin cliffs will definitely be on our itinerary when we finally get to Iceland. We saw puffins in Newfoundland a few years ago but from quite a distance and my daughter was a bit disappointed. She would love visiting these cliffs! Oh my gosh the puffins are so cute!! I really wanted to do this when I was in Iceland but was so bummed how out of the way it was. Glad you decided to venture off the beaten path and bring us these awesome photos! I wish I’d gone here when I visited Iceland last year. These puffins are such adorable little creatures and you have captured them so well on camera! I had no idea puffins were such good swimmers! Those Puffins are so stinking adorable. I keep hearing nothing but amazing things about Iceland and the Golden Circle. I’m seeing a lot of posts about Iceland lately and this is the first time someone’s written about these adorable little guys! We’ll definitely make a trip out here when we go and we’ll make sure we go in Apr to Sept to see the puffins. Thanks for the tip about having a full tank of gas on HWY 612! That would be horrible if someone ran out of gas there. There’s a closeup shot of a puffin- how close were you able to get? We were able to get quite close, the puffins didn’t seem too concerned with our presence. A Library of Water? I’ve never heard of a thing! Do the different cylinders look different? Oh my! The puffins don’t even seem real. Added to my list of reasons to visit Iceland. 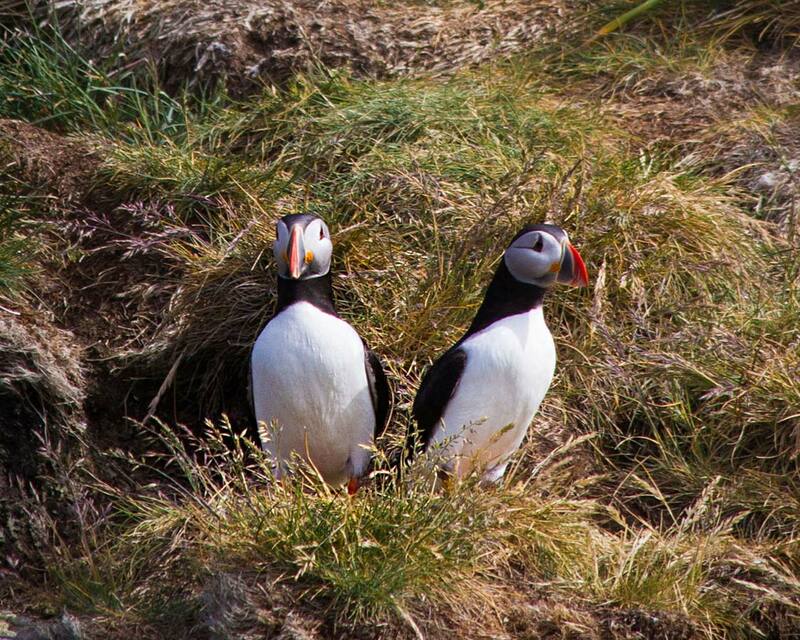 Must see puffins! Oh, those puffins look so cute! Nice pictures! I love the lesser traveled parts of Iceland like Snaefellsnes, but have yet to make it as high as the West Fjords. I can’t read a thing about Iceland without finding some new thing to add to my wish list for a future trip! I love this post! I always seem to forget about puffins, but there are moments I remember they exist and I get giddy again. They’re so cute and unique looking! This looks like a lovely trip to Iceland and I’m happy your little ones enjoyed it as well! This looks like my kind of place. I didn’t realise 60 percent of the world’s Atlantic puffins nest in Iceland! I’ve seen penguins in Antarctica and polar bears in the Arctic. Atlantic puffins in Iceland have moved up my list! Puffins were the main reason I wanted to travel – not the blue lagoon or waterfalls. Shocker. But when I went during the winter – there were no puffins around. I should’ve known. However, I had the most amazing time exploring the island and I am so glad it worked out that way. Now I need to head back to see these little cuties. A shame you didn’t get to see them during your visit, but all the more reason to get back! Ahhh the Puffin is sooo cute, they are like little plushies, so adorable! Iceland is a destination we can’t wait to go visit. The nature is what attracts us the most! OMG! I really want to see a puffin in real life. They look so incredibly adorable. Can I buy a ticket to Iceland and photograph them all? 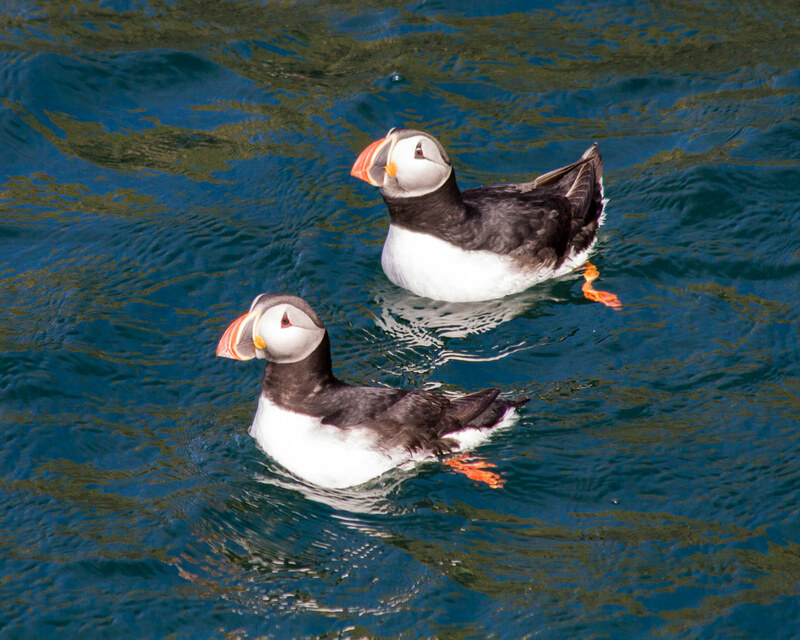 Puffins were the favorite part of our trip to Iceland – we didn’t make it to the Westfjords, so would love to get back to explore that part of the country, but we did make it to Tjornes. We ended up leaving at the end of the day covered in bird droppings because we were sitting there for hours just photographing them in awe! Oh I love places that are off the beaten path and often overlooked by tourists because of location. I can’t imagine seeing thousands of puffins! So cool! Thanks for sharing. Confession: I wanted to go to Maine because I wanted to see puffins then was TOTALLY disappointed when I was told there would be a 0% chance for me to actually touch one/need binoculars to see one on the islands! I think I’d much rather head over to Iceland to see the puffins! You won’t have any luck touching them there either 🙂 They let you get close, but not that close. Iceland looks like such an amazing place! It is on our list for 2017! The boys are all about animals right now, and who could not love these cute little guys!!! What a great post and aren’t those puffins adorable! I aim to go to unusual places as much as possible. Now being that I actually live in Germany, Europe isn’t remote for me. Some destinations might be far-out or isolated, but not really remote anymore lol! I would say that the most remote place I’ve been to is in Tunisia. We rented a car and took the road that led to the Sahara Desert for a laugh! It was really remote and after not seeing a single car in three hours we decided to turn around as we didn’t have any extra supplies, and we got worried about running out of petrol…! p.s. 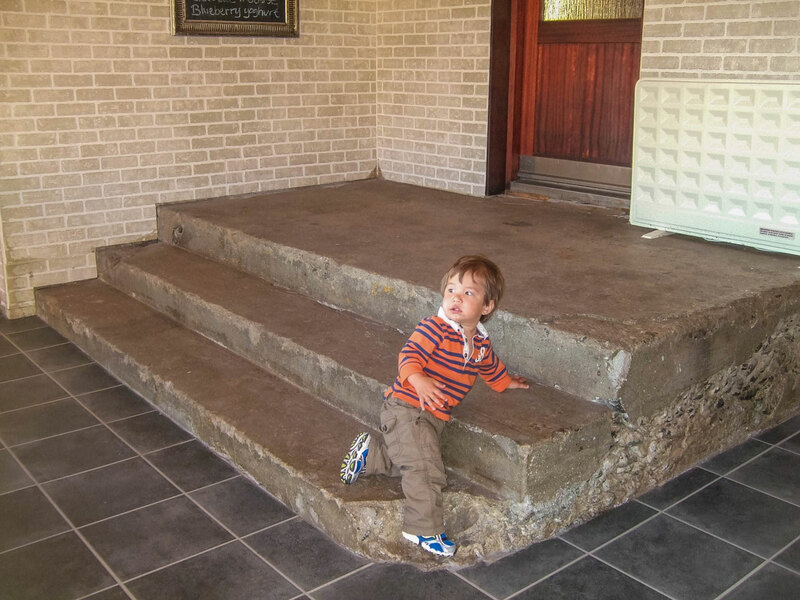 I wouldn’t recommend doing this, but we were young and stupid in those days, and not yet parents lol! That was on my list of must-sees in Iceland but sadly, not enough time 🙁 I heard their populations are really dwindling due to overhunting. The kids must’ve loved it! all I can say is wow! your pictures are really beautiful and I will be checking this place out when I go to Iceland. I hope you get to visit. It’s fantastic! Wow! Puffins seem like a cartoon come to life. We can’t wait to see them for ourselves too. Thanks for this post. We saw some puffins but not this up-close like you did, amazing! I didn’t know you could stay near the cliff as well! I want to go! How beautiful. I guess the most remote place I have been is Churchill, Manitoba (no roads in or out) or the Andes in Peru (again, no roads and no other tourists for days). Lovely post and of course the Puffins take the cake. What lovely and fascinating creatures. It is really amazing that they can swim and also are able to fly upto 80 Km./Hr. It is a dream to see puffins in real. I have not seen them in zoos anywhere and their pictures always fascinated me. I have to chalk out a plan to visit this country. This really is amazing. Aren’t puffins just the most intriguing birds around? They’re my #1 reason to visit Iceland. I heard you can eat them… do you know if this is true, did you see it advertised anywhere? And would you eat one?! We did see people harvesting the eggs earlier that day. While I didn’t see them on the menu of any of the restaurant, I know that the meat is often smoked and the hearts are sometimes eaten raw. 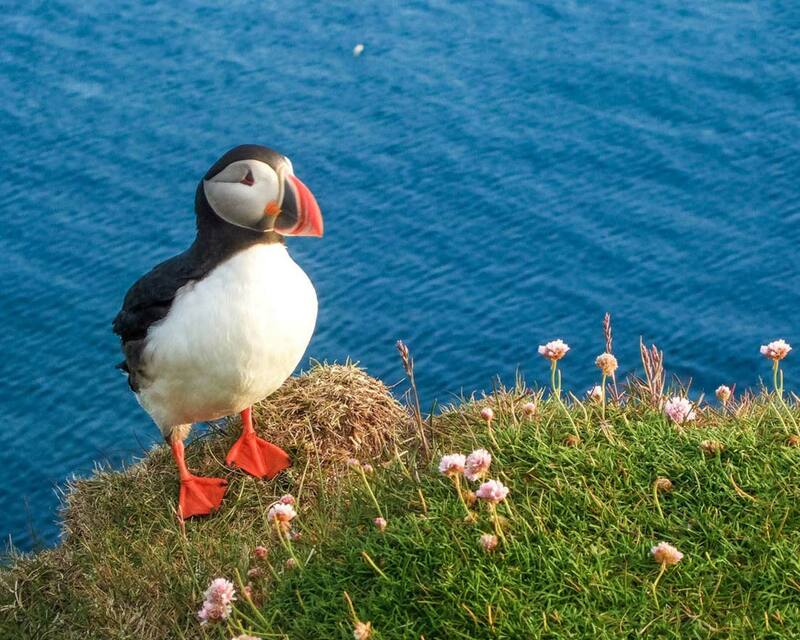 Your photos of the puffins are amazing! What wonderful creatures!! The puffins are so adorable. I am sure your little ones must have found the whole experience delightful. I know I would too. Thanks for the quick facts on them. Was interesting to know more about them. They’re so cute, Kevin. Great article. More reads from you.